Grove is open Sunday noon-6 pm. Grove Winery specializes in growing and crafting exceptional European-style wines. 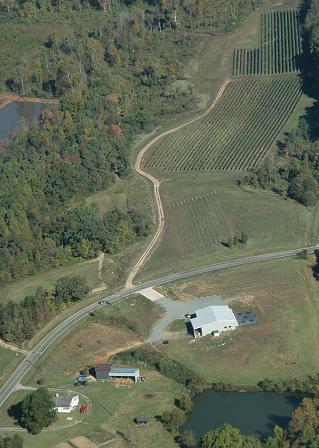 The main estate vineyards, winery, event facilities and tasting room are located just 7 miles northeast of the Greensboro city limits in the the federally recognized Haw River Valley wine country, a short drive from anywhere in the Triad or Triangle. The sloping, mineral-rich estate vineyards feature wine grapes that thrive in this microclimate like Cabernet Sauvignon, Nebbiolo, Cabernet Franc, Merlot, Sangiovese, Chardonnay, Tempranillo, etc. Grapes are hand harvested and used for a limited production of 3000 cases of premium wine each year. The Grove tasting room is open noon - 6 pm daily for tasting, shopping or simply a glass of wine on our patio overlooking Lake Cabernet. Our standard tasting is available noon-6 pm daily for $7 and includes six wines from our daily tasting sheet. No reservations are needed for parties of less than ten. If you'd like to be updated on events going on at the Grove, please subscribe to our email list. You can unsubscribe at any time and your address will not be sold or given to any outside parties. Grove Winery hosts concerts throughout the year with our Wine & Song Concert Series. The next concert will be on Saturday April 6th with The Retro Band. Tickets are available at the door. A limited number of reserved tables and advanced discounted tickets are available here. Grove Winery has signed on as a venue for the national Winery Comedy Tour bringing great nationally tour comedians to NC. Our first two shows of 2019 sold-out quickly, so the promoter has added additional shows. Nationally touring comics will come to Grove Winery on Friday 3/22, Friday 4/26 and Friday 5/25. These events feature adult themes and language and are ticketed by the promoter, click here for ticket availabilty. Join us for a fun, casual painting class at Grove Winery. The next class will be on Thursday, May 16th at 6:30 pm. Price includes materials, instruction and a beverage of your choice. Canvases need to be prepared in advance, so make your reservation now. Grove Winery's 2013 Estate Block B (Meritage) and 2017 Estate Haw River White were awarded medals by eight Advanced Sommelier judges at the 2019 NC Fine Wines Competition. The Block B was also a medal winner at the 2019 San Francisco Chronicle Wine Competition. For a complete list of Grove's award winning wines, click here.